No section about the ghosts and hauntings of southern Illinois would be complete without the Three Mile House. This historically haunted building was once located on Illinois 159, just north of Edwardsville, Illinois. Even though it burned to the ground in 1985, the stories about the place continue to be told today as new generations of ghost story enthusiasts still get chills from recountings of the ghostly events which took place here. The history of the Three Mile House begins in 1858, when it was built by a St. Louis barber named Frederick Gaertner. It opened its doors along the St. Louis-Springfield stage road in 1860, at a time when this would have been main road through the region. The inn and tavern proved to be a popular roadside establishment. The first section of the Three Mile House was ready for business by 1860. The place had been built to primarily serve as a tavern or inn where travelers could eat, rest and spend the night. Those to whom the inn offered hospitality were mostly individuals traveling by horseback or buggy and most importantly, farmers and cattle drivers taking their stock to the markets in St. Louis. Gaertner's business increased enough to justify enlarging the original building to include a dining room, kitchen, tavern, grocery store and post office on the first floor and between 10 and 15 sleeping rooms on the second. A large attic may have also served as to house guests. 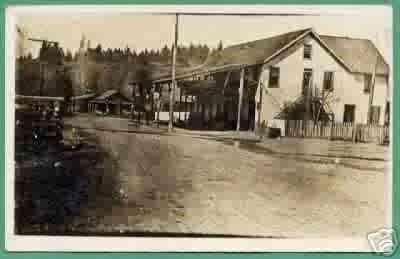 The inn remained prosperous for more than two decades, although things began to decline by the 1880's. By this time, the railroads had begun to make stagecoach travel, at least in the east, obsolete. After a few seasons of declining trade, Gaertner decided to close the inn and he returned to his birthplace in Pittsburgh, Pennsylvania. When he passed away, the land, and the now abandoned tavern, were left to his son, Tony. The Three Mile House stood empty for the next 25 years, slowly deteriorating, until Tony Gaertner sold it to an Illinois road contractor named Orrie Dunlap. Dunlap was in possession of some very lucrative contracts with the state to build and pave Route 112 (now Route 159). He decided to buy the empty Three Mile House. Here, offices could be set up and his men could be fed and even quartered during the many months it would take for the road to be built. After the highway was completed, several others leased the inn until Roy Mohrman of Collinsville bought the land outright. In the year priors to this, and during a period in which a succession of different owners claimed the property, the house was allegedly used for a variety of notorious purposes. The Three Mile House was said to have been used as a gambling house, a bordello, and a bootlegging operation during Prohibition. As all of these activities were obviously illegal, no records remain to say exactly who ran these operations and only rumor and legend exist to tell us what went on there during these lost years. The decades of the 1920's and 30's are lost but we do know that in the 1940's, the house operated as a roadside tavern. After the 1920's, a number of other legends began to be told about the Three Mile House, although it would not be until the days of the Elliot family that the general public would learn the place was haunted. These legends told that the Three Mile House may have briefly served as a station on the Underground Railroad. Apparently, tunnels existed which began in the cellar of the building and connected with small rooms in the back yard. One of the tunnels was even alleged to have journeyed into a nearby cemetery, where escaped slaves could vanish into the forest under the cover of darkness. Later on, the Underground Railroad was serve as the source for one of the tavern's most famous hauntings. In 1970, the Three Mile House was purchased by a real estate developer named Merrill Ottwein, who hoped to renovate the place and open it again for business. Unfortunately though, Ottwein never had the time to devote to the project and the house was placed on the back-burner, where it remained for five years until it caught the attention of Doug and Beverly Elliot. As luck would have it, they were in the market for a new home and discovered the Three Mile House was for sale. At that time, it was still in pretty bad shape and it had been more than 12 years since anyone had lived in it. Still, the Elliots felt drawn to the place and decided to buy it, having no idea how the house would change their lives. The family spent the next year carefully renovating the house. It was back-breaking work that would eventually pay off by getting the house listed in the National Register of Historic Places. They reinforced floors, put in first floor rest rooms, a scullery was added to the kitchen for dish washing, they installed modern plumbing and cleaned and repaired the place from top to bottom. During the work, they discovered the mysterious tunnels extending out from the basement. They also found names and dates carved into the old wooden beams and Doug Elliot later heard a story that a previous owner had found a skeleton between the walls in the 1930's. While the discoveries in the basement were strange, they weren't nearly as strange at the small balls and sparks of light which flickered about in the building each night or the fact the Elliots younger daughter, Lynn, swore that dark shadows were chasing her about her room. The weird events continued and soon, the balls of energy, strange sounds and weird tapping and knocking noises became everyday events to the Elliots and they got used to them. Slowly, they were beginning to accept the idea that the Three Mile House might be haunted. On opening night of the new restaurant, in the Spring of 1976, Bev Elliot's worst fears seemed to be coming true! The first evening, a little while before the customers arrived, the heavy dining room chairs began sliding away from the tables and rocking back and forth. Each time a chair was replaced and the staff member turned her back, the same chair (or another one) would mysteriously rumble away from the table again! Then, dishes began rattling in the china cabinet, vibrating as if they were about to fly across the room. But, as soon as the first guests arrived, the activity suddenly stopped and the house remained quiet for the rest of the evening. At first, the spirits only seemed to perform for the Elliot family, but then odd things started to happen around the restaurant workers as well. One of the cooks claimed to see a misty-looking man in an Irish derby, who appeared at the top of the stairs. Another waitress saw a face in a mirror (that wasn't hers) and others saw candles lifted off tables under their own power. Another cook reported seeing a tray filled with coffee mugs hovering about a foot above a table. Water taps were also turned on and off, stove knobs were twisted, and even the piano played by itself. A former employee who I spoke with told me of many nights when she would feel the tug of an invisible hand on the back of her shirt. Each time she turned around, she would find no one there. Apparently, this was a regular occurrence, along with dishes which would move about from place to place; water glasses that would suddenly empty their contents onto the floor; and napkins which would somehow fold and unfold with no one around to assist them. After about the year, the ghosts began to perform other tricks and started entertaining the customers as well. While many of them were fascinated and intrigued by the bizarre events, others were not amused. Tables jumped and hopped across the floor, dishes were reported to levitate and on occasion, customers had to keep scooting their chairs forward just to keep up with their food! As time passed, the Elliot family continued to have weird encounters in the house, including Doug Elliot coming face to face with the apparition of a large, black man.. a man his daughter had seen before and who was apparently a spectral fixture in the house! Doug also reported being awakened on occasion by the voice of a little girl. After the restaurant had been open awhile, newspapers in the area began giving them good reviews and they later won several awards. However, with every article written also came mention of the ghosts. The stories helped business and put the Elliots into contact with psychics and ghost hunters from around the country, many of whom traveled to the Three Mile House. Among them were Chris Mitchum, the son of actor Robert Mitchum and Cyril Clemens, the cousin of author Mark Twain. In 1977, several members of the cast of the movie Stingray, which was filmed in the area, decided to hold a seance in the house. They wanted to try and get in touch with the ghost of the black man who had so frightened Doug Elliot. According to psychics, he was the unofficial leader of the ghosts in the house. What they learned was that the spirit's name was actually Tom and that he had been an escaped slave who had come to the Three Mile House along the Underground Railroad line. In fleeing from the south, he had accidentally killed a white woman. A group of men somehow managed to track him down and had brutally murdered him. He was buried in one of the tunnels beneath the house but his spirit was not at rest. Tom had been a deeply religious man in life and as he had not received a proper Christian burial, his spirit was disturbed. Doug Elliot was moved by this story and spent quite a bit of time looking for Tom's grave. There were just too many tunnels though and sadly, the grave was never found. As time passed the ghosts remained a constant part of the business. Tom was perhaps the most active and playful of the spirits, leaving faucets running and flooding the kitchen and the bathrooms and generally being a nuisance. One day, an upset waitress informed Bev that she would not be able to work in the afternoons any more. When asked why, she stated that Tom had found a new toy, an antique coffee grinder. He had been amusing himself by turning it all day and the clanking noise that it made was driving the waitress crazy. After a frightening incidents when Lynn saw a menacing face outside her window, the problem of the ghosts began to seem more negative than helpful. It also seemed that problems with the restaurant began to multiply. Despite a reputation for fine food, the restaurant began to see a slow-down, thanks to its rural location. It also seemed as though power bills had become astronomical, thanks to the fact that the large, old home was so hard to heat. Plus, operations costs for the restaurant continued to increase monthly. Another frightening incident took place in 1980 when radio personality Jim White of KMOX in St. Louis asked to broadcast his popular Halloween show from the Three Mile House. The Elliots agreed, with the condition that no Ouija boards were to be used and no seances take place for the show. Unfortunately, one of the guests either forgot about this stipulation, or ignored it, and brought a Ouija board along anyway. According to the Elliots, the result was chaos. A loud scream frightened everyone in the restaurant as a cook ran from the kitchen, claiming to be terrified by a green-faced, red-eyed monster which had appeared in their midst. Soon after, psychics worked to try and clear the house of this spirit. Eventually, they announced the spirit had been expelled and order was restored to the place. Even so, the incident left the Elliots wondering if the continued cost and stress of running the restaurant was worth it. Soon, they decided to put the place up for sale. Some believed the spirits had drained them of their energy, but the Elliots dismissed this. The tension, pressure and exhaustion of running the business had just become too much for them, they said. Regardless, they were heartbroken when they left the house for the final time. In 1982, the Three Mile House was sold to John Henkhaus, who also operated the house as a restaurant. He continued the renovation of the building and added a new kitchen and some additional plumbing, however, a short time later, Henkhaus was also added to the list of previous owners of the Three Mile House. The building was then bought by Steve and Mitzi Ottwell, who owned the house at the time of the fire in 1985. Today, all that remains of the Three Mile House is a large, grassy mound, a few scattered bricks and of course, an enduring reputation as the most haunted place in the Riverbend Region.... a title that it will most likely hold for many, many years to come. The location of the THREE MILE HOUSE can still be seen today off Route 159 between Route 140 and Edwardsville, Illinois. The site is off to the east side of the roadway and is directly across the street from a small cemetery. There is housing nearby and some of the walls, walks and garden areas here were built with bricks from the old house.